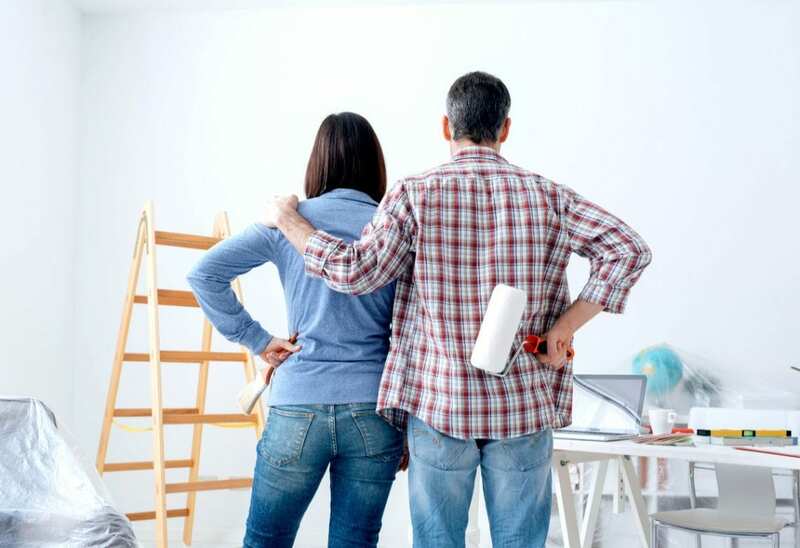 As a homeowner, you’re probably always on the lookout for inexpensive ways to improve, update or enhance your investment. Every homeowner will tell you that there are lots of little things you can do to make-over your living space and many of them require very little money. Here are some quick weekend home makeover ideas with manageable projects you can complete before you head back to work on Monday. Painting walls is such an easy, relatively inexpensive way to significantly improve the look of most spaces. With a gallon of paint averaging $18-$24 dollars, you can paint a sizeable space on a limited budget. The majority of the time investment with painting is in the prep, but it’s also a time-saver on the back end. To prepare a wall for painting, remove shelves, pictures or other adornments. Then, remove the molding along the bottom border of the wall. Using blue painters tape (similar to masking tape), tape off borders, along the window, or anything else that’s not getting a fresh coat of paint. From there, get creative! Experiment with color combinations and textures to get your ideal look. And don’t feel like you have to paint an entire room to get an updated look; try one accent wall, and you may be surprised how it changes the room. If you want a new look in your living room but can’t spring for new furniture, consider rearranging and updating accent pillows. The beauty of rearranging the room is that it’s temporary: you can change it back if you don’t like it. However, once you make a change, stick with it for one week before deciding whether to keep it. It takes a little time to get used to a new look. Adding new accent pillows can also give the room a colorful life without breaking your budget. Many people overlook drapes, curtains, blinds, and window shades when deciding on a room makeover. But the smart designers know that updating them can really bring a new dimension to windows. Consider new curtains or drapes, but also look at the hardware – rods and creative pull-backs will add to your design as well. Lately, internet sites like Pinterest are loaded with crafty uses for pallets. There are plans for making coffee tables, chairs, and futon frames as well as using pallets for gardening, hand-painted signs, and more. Best of all, pallets are critical in the shipping and trucking industries; thus, they are in large supply and easy to find. Check sites like Craigslist: often you’ll find ads for pallets in the “free” section. Many businesses offer free pallets simple to dispose of them. If you’re looking to improve the curb appeal or exterior appearance of your home, add a little color by planting flowers. Small greenhouses and garden stores have annual and perennial flowers for sale and the prices are very affordable. Consider adding a window box (another use for pallets) under a front window or a large pot of flowers by the front door. Get creative with planters, too. Some of the best planters are common items repurposed to hold flowers. A splash of color incorporated into your landscaping will go a long way toward sprucing things up. Try all of these quick weekend home makeover ideas for a fresh new look!